Thank you for your query, please find the link below to the manual for this machine. I have an old electric Brother AX 110 typewriter and am looking for a ribbon, preferably black and red if possible? We only stock the black Brother 1030 ribbons listed on this page for use in the Brother AX-110 electronic typewriter. Both of these ribbons will work reliably in your AX110 printer, the only difference between them is that the genuine Brother 1030 ribbon is manufactured by Brother whereas the compatible 1030 ribbon is made by a thrid-party manufacturer as a cheaper alternative. I would like instructions for using the Brother AX-110 typewriter? Sorry, we only supply ink ribbons for the Brother AX-110 typewriter. Please contact Brother for technical support or refer to your Brother AX-110 printer manual for operating instructions. The Brother AX-110 is a portable electronic typewriter, designed to give you years of reliable operations. It features a daisy wheel cassette, which makes typing easier and faster. The device even has a built-in handle for convenient transport. Built for on-the-go users, the Brother AX-110 electronic typewriter printer is a good choice for those in need of a convenient document processor. However, there are much more convenient devices for portable printing that use more up-to-date technology than the AX110. The Brother AX-110 ribbon printer has a typical design, featuring a standard size keyboard with a removable cover. It has a rolling paper feed for manual feeding along with a cassette ribbon for mess-less replacement of the daisy wheel. The device also uses correctable and nylon ribbons for clear and neat typewriting. The Brother AX-110 printer is an excellent word processor, steps above your typical manual typewriter. 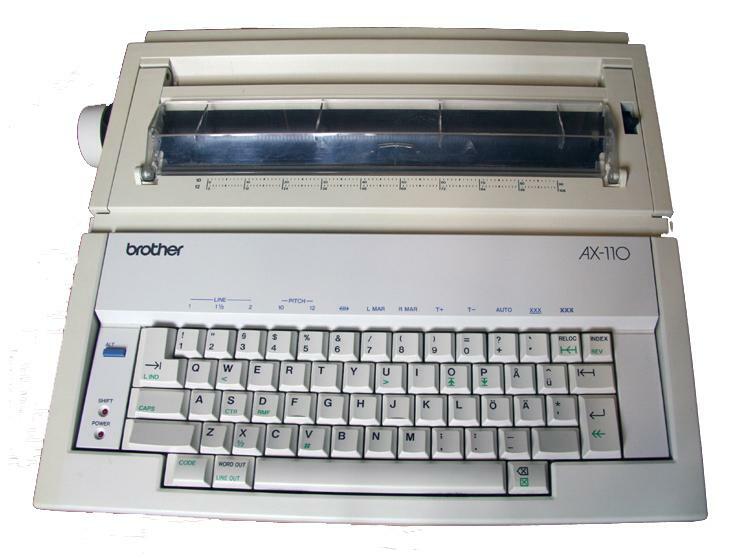 One of the main selling points of the Brother AX-110 electric typewriter is the inclusion of a correctable ribbon, which allows simple editing of mistyped words. The AX-110 typewriter also features a convenient paper feed, along with paper guides for easy installation of media. It has adjustable margin, line space, and pitch settings, which makes it easier to format documents. Selecting typing functions is also very convenient, thanks to easy shortcut keys. Consumables for this machine include low-cost Brother AX-110 film ribbon cassettes which minimise the running costs. The Brother AX110 typewriter is a good alternative for users in need of a reliable word processor. However, it's quite an outdated machine. There are many portable printers in the market that offer more advanced methods of printing on the go.